me decided to go to bandipur to visit the Bandipur National Park on Friday. Well this trip was even less planned than the dandeli one. Atleast for the dandeli one, I had an address, a telephone number and a name to look for when I got there. The Bandipur trip was totally chaotic from the word go. Started at 10:00 from Bangalore. When we landed at KGBS, heard that there was a strike in Tamilnadu and all outward buses to T.N were cancelled. Bandipur lies on the border of Karnataka and T.N and one needs to take an Ooty bus from Bangalore to reach there. Once we got the refund, we decided to take a bus to Mysore. Reached Mysore at 14:00 (blame the traffic), had lunch there and took a bus to Ooty (strange!). Bandipur is 18 KM from Ooty and around 13 KM from Gundlupet (the last place where IT-people can survive). Reached Bandipur at 17:00 and immediately took the mini-van jungle-safari. The mini-van safari costs around Rs.75 and is recommended if you are on a shoestring budget or are travelling with a large crowd(15-20) in which case you can book the whole van for around Rs.3000 (will tell why this is a good thing later). The problem with the mini-van is that it's very very loud (animals in Africa can hear it), it's crowded (and hot), you'll have babies in the bus who can't stop crying and that everpresent jerk who thinks he's funny everytime he shouts "Look! TIGER!". 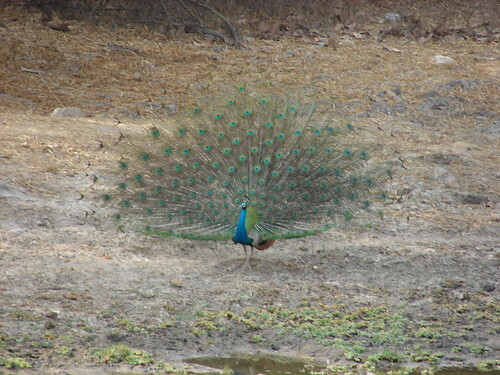 Saw a bunch of peacocks, spotted deer and a elephant family which practiced "We 2, Our's 1". After the safari, we had a problem, No place to stay and it was getting dark, fast! We tried the forst department if they will have us for the night, but they just shooed us away. As luck might have it, the person manning the STD/ISD booth helped us out by giving us the contact info of a farm owner who might have a "room with a double bed". Seeing the sun go down, we had two options, take the offer or prepare to be scratched and mauled by local langur's. We took the safer option. The farm house we were to go to was around a couple of kilometers from the national park. It's pretty close to Tuskar Trails, a pretty well known resort. The owner (?) of the farmhouse Mr.Shumalu was very kind and showed us to the room. It was nothing to talk about: a double-bed, a bulb and an attached bath. We took the room and cleaned up. I guess we were just lucky as all throughout the night, cars kept pulling up to the farmhouse asking if any room was available. The place is packed during weekends as people come in from Kerala and T.N to dirty up the place. We just got lucky in finding a place to sleep. Saw daybreak after a long time. 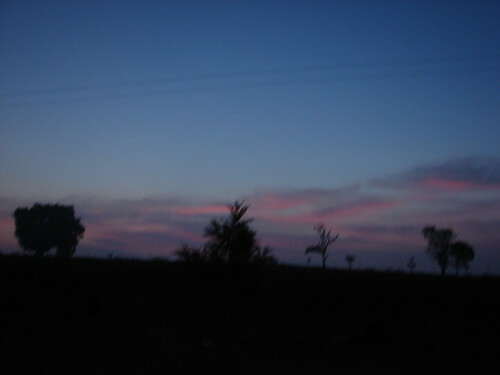 Beautiful..
Was back at the Bandipur National park at 7:00. Not quite satisfied by the mini-van safari the previous day, we decided to take the Gypsy Safari. This has a bag of advantages. It's quite, the driver stops the vehicle when you want it to, your party is the only one in the vehicle and he will take detour's into the jungle rather than follow a tar road. Downside ? it's costly, around Rs.1750 per jeep (can accomodate 6 people). Moving into the internal parts of the jungle gives you the probability of catching a glimpse of shy wildlife. We saw a bunch of tiger pugmarks all around the place. Either we were late in spotting the tiger or it didn't want to be seen. At all times you have the feeling that a tiger is watching you from the tall grass which is prevalent in the jungle. Spotted a Malabar red squirrel which os pretty huge for a squirrel. We saw a bunch of sambar, it's strange how sambar look so meek in photos but if you get close to one you can really feel it's presence. The male sambar is almost as big as a horse and is a daunting sight as it leaps away at the faintest sound. Though the jeep safari is around 90 minutes long, the last half hour was kinda boring as it was almost 10:30 and was starting to get hot. No hope of any animal coming out of the coolness of the jungle to be photographed by a bunch of camera weilding IT folk. We had plans of visiting Ganeshgudy Betta but couldn't find anyone to take us there. So by 11:00 we decided to start the journey back to Bangalore and boarded a Mysore bus. When we got to Gundlupet, people were talking about riots in Bangalore and Mysore. When we got to Nanjangud, the bus stopped and we were told that all buses to Mysore have been cancelled due to bus/lorry burning on Mysore highways. Time is around 11:30. After a hour of sitting at the Nanjangud bus terminus and getting our nerves in order we decided enough was enough and decided to keep moving towards Bangalore. Took a private van to Mysore. On the way to Mysore we saw the burnt vehicles being towed way. Reached Mysore at 14:00 to see large groups of people walking and the city almost shutdown. Most of the shops were half-closed. Immediately took the next bus to Bangalore and reached 'bang' safely at 18:00. Will definitely visit Bandipur again, just to relive the travelling experience. There's something about mixing with the local population and eating, sleeping and commuting as one among them. Short and Informative & Objective blog on Bandipur . We have added link to your blog from our portal - Travel Paisa - Budget Accommodation Directory under destination guide Karnataka. Our portal aims to enrich people's life by encouraging them to travel. We list good decent budget family accommodation with reviews from our editorial team and from users across the world. people come from Kerala and TN to "dirty up the place". I notice you specified those 2 states. Any reason? Nothing against these two states, being from Chennai myself. I guess anyone who throws trash is guilty. Apologies if the statement sounded prejudiced against any state in particular. Can you pls get me the contact info of d farm owner who gave you accomodation. Landed here from a Google search on bandipur..
A popular Ooty hotel must be both affordable and have good customer rating. Hotel Sarkar Palace is one such Ooty hotel. It has a customer rating of 4 star (out of 5) and rates start from Rs. 1000 per night. Find out more about Hotel Sarkar Palace and check out a list of hotels in Ooty in a wide range of price and facilities at HotelPushpak.com. me and my friends also visited bandipur, there are so much of beautiful resorts in Bandipur.. 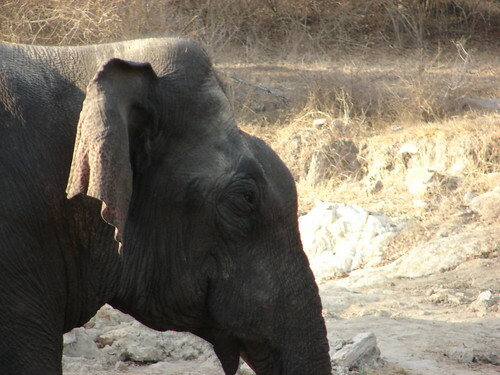 If you're looking for a weekend break then Bandipur national park should be your destination. There are plenty of hotels in Bandipur serving you with the best facilities. A perfect getaway Bandipur is a must visit location, located in Gundlupet taluq of Chamarajanagar district. On the route to a major tourist destination of Ooty, Bandipur sees a lot of tourist traffic and there are many places to visit in Bandipur. It has a wide range of flora and fauna, Bandipur national park is ideal for wildlife lovers.Thanks for sharing it. Great post!! thanks for sharing this wonderful post in this blog. Loved reading this blog. It is really informative blog and it helps people to plan for trips. Plan your trip by booking bus tickets in advance in Online Bus Ticket Booking portal and enjoy your trip with family. Never forget you can brighten your screen up manually. Games in abandoned buildings or dark caves can create awesome ambiance, but it won't help you perform better. You may find buying Maplestory M Mesos that you're frequently being attacked because you can't see. Even though the ambiance of the game will be affected slightly, increase the screen brightness. Distinguishing colors is easier and you can get the jump on your enemies. If your children are quite young, you will want to completely disable all chat features. You should not expose your young kids to these types of communications. Only purchase games that allow you to disable chat, so it is important to do your research. If you can't figure it out, search online for more information or talk to the people in the store. Look at the fine print of Internet games. Sometimes, online games can involve a steep fee for playing. Anytime your children wish to join an online site, be sure you review it in advance. Be certain about fees. If there is a fee, decide whether or not the game is worth it. you suspect you are becoming addicted to anything, including gaming. Think about the kids in your house before letting them play mature games. You can set up consoles so as not to be able to play adult content. It can also be done with a PC, but this takes some skill. Be on top of how to watch over your child's gaming habits.Libraries often lend MapleStory 2. They have a huge selection to choose from. Call your library or check their website to find out which MapleStory 2 they have.Read reviews and take a turn at playing your child's favorite MS2 to keep yourself involved in what your child is experiencing. Give the game a try, play with your child or just enjoy watching her play it. Make sure to inquire about the games and let them know you are interested. Nothing beats hands-on experience though! Even though the PS2 may not be the cream of the gaming system crop, if cheap is what you are after, it's probably your best bet. PS2 game prices generally run about 50% of the price of games for a modern console. The secondary market has a decade's worth of used games available for the PS2. You will not feel amateurish once you have the right tips. Utilize the information in this article to get Maple Story 2 Mesos guide you along the path to successful MapleStory. You can also use this great advice to make a good gaming experience even better.